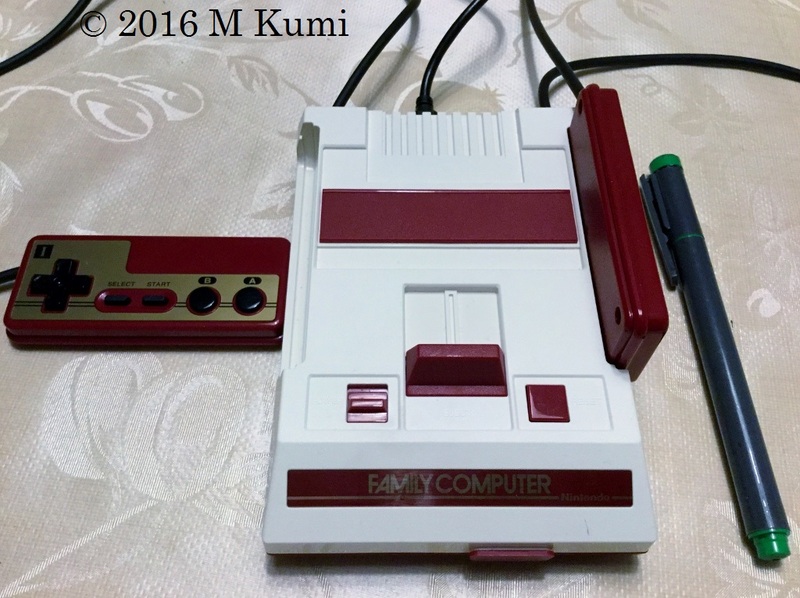 I bought the Nintendo Classic Mini Family Computer for my children. It was the first time for our family to get a Video game console. My husband and I were considering what kind of games we should give to our children. Actually, most of my son's friends already had the Nintendo 3DS, but we didn't want our son to play it because it could make his eyesight get worse. And we really didn't like to see that kids play it at the restaurant, on the train, at the hospital, at the park eveno though they were with their friends or families. We thought we could play it together if we got the Nintendo Classic Mini because it includes 30 old games which I enjoyed playing them when I was a kid. My 7-year-old son was so excited to get the games console and he enjoys playing it every day. We made a promise that he can play it for 30 minutes on weekdays, for 1 hour on weekends after he finishs doing homework. He keeps his word, but I have to tell him every time. "It is the time to stop playing!" He likes "Super Mario Brothers" and "Kirby's Dream Land". I loved "Super Mario Brothers" when I was a kid. I was absorbed in playing it. Interestingly enough, my 6-year-old daughter never plays it. "I don't want to play it. It is scary. I must not be able to play it well. It's fun for me just to watch him playing. Three of my son's frineds came to our house last week and they were so excited to see the 30 old games and enjoyed playing them very much. It was interesting that boys who are used to playing 3D games really enjoyed the very old games. I think it means that it is not so important that the game is the latest. 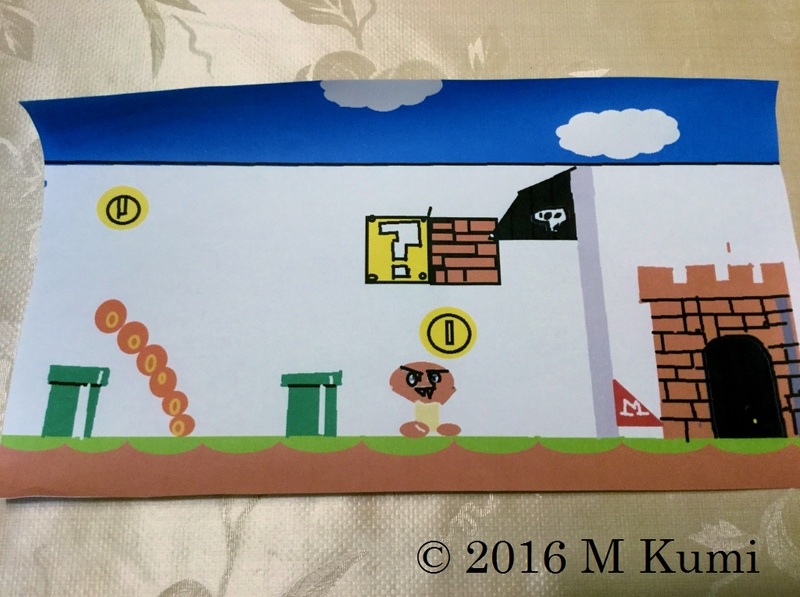 My son drew Mario's world using MS-paint. 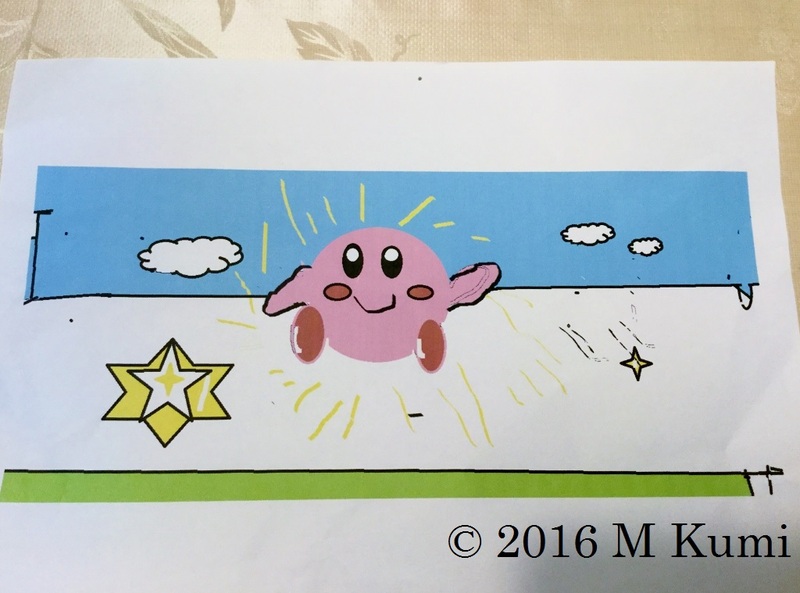 My daughter drew Kirby's Dream Land using MS-paint. It seems as if you will be set for much fun and frustration playing the games on the Nintendo. It is worth pointing out to your daughter that the older games were much harder to play then newer more modern games. The older games could not depend on impressive graphics such as 3D environments and so had to have good game-play and replay ability. One of the ways to do that was to make them harder to play by using features like limited lives and making you start all the way back at the beginning of the game if you failed. The older games also required quick reactions. I remember playing Donkey Kong, Q-Bert, and Pacman/Ms-Pacman, they were fun and you really had to pay attention to have any hope of success while playing those games. Though I don't tend to play action games anymore I am more fond of puzzle games that keep my mind working. It was the first time for our family to get a TV game. It was the first time for our family to get a (Games Console/Video Game Console). Reason: Although in Japanese you would use テレビゲーム or ビデオゲーム in English you will almost never hear someone call them TV Games. Actually, most of my son's friends already had the Nintendo 3DS, but we didn't want our son to play it because it could make his eye sight get worse. Reason: Corrected eye sight changed it into one word "eyesight"
And we really didn't like to see that kids play it at the restaurant, in the train, at the hospital, at the park although they were with their friends or families. And we really didn't like to see that kids play it at the restaurant, (on/in) the train, at the hospital, at the park, (even though/despite the fact that) they were with their friends or families. We thought we could play it together if we got the Nintendo Classic Mini because it is included 30 old games which I enjoyed playing them when I was a kid. We thought we could play it together if we got the Nintendo Classic Mini because it (comes with/includes) 30 old games which I enjoyed playing when I was a kid. My 7-year-old son was so excited to get the game and he enjoys playing it every day. We made a promise that he can play it for 30 minites on weekday, for 1 hours on weekends after he finishs doing homework. We made a promise that he can play it for 30 minutes on weekdays, for 1 hour on weekends after he finishes doing homework. Reason: Corrected spelling for minutes, changed weekday to weekdays as there are multiple weekdays. Changed 1 hours to 1 hour, as there are multiple hours you are only using 1 of them so it is said singular (strange English quirk). Corrected spelling of finishes. We made a promise that he can play it for 30 minutes on a weekday, for 1 hour on weekends after he finishes doing homework. "It is the time to stop it!" "It is time to stop (playing)!" "I don't want to play it. It is scared. I must not be able to play it well. It's fun for me just only to watch his playing. "I don't want to play it. It is (scary/overwhelming/difficult). I must not be able to play it well. It's fun for me just to watch (him/his) playing. Three of my son's frined came to our house last week and they were so excited to see the 30 old games and enjoyed playing it very much. Three of my son's friends came to our house last week and they were so excited to see the 30 old games and enjoyed playing them very much. Reason: Corrected spelling of friend also made it plural friends as multiple of his friends came to your house to place the video games. 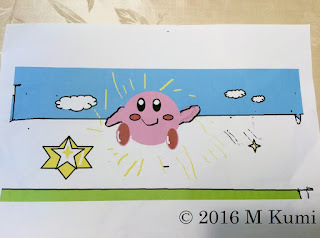 My daughter drew Kirby's Dream Lans using MS-paint. Reason: Corrected spelling mistake for Land. Thank you always for your cooperation. I was surprised that I made a lot of easy mistakes. I realized that I need to keep writing. I will try to write this blog more.